Believe it or not, whenever you use your credit card, there is a lot going on behind the scenes of each transaction. While a lot of it might seem as exciting as reading a legal document, it does benefit you as a consumer to understand the major players involved in your financial business. Here, we break down some of the key terms and processes behind credit card transactions, and why it's in your best interest to school yourself on the entities that fuel your plastic power. When it comes to opening a credit card, there are two major players: The issuer and the processor. The issuer is the bank that issues you the card, and the logo you see on the card (Visa, MasterCard) is the processor, explains Beverly Harzog, credit card expert and author of "Confessions of a Credit Card Junkie." "So if you get a Chase Freedom® Visa card, that comes from Chase bank, the issuer, and Visa is the payment processor." Payment processors are also referred to as card networks. "The issuer makes credit card limits available to its cardholders and is ultimately responsible for sending payments to merchants for cardholder transactions. The networks then act like complex computer systems that facilitate the processing of those credit card transactions," explains Eli Snyder, consumer credit counselor at the Minnesota-based Family Means CCCS, a member of the National Foundation for Credit Counseling (NFCC). An exception to this distinction between the two roles is found with American Express and Discover, since these two entities both issue cards to cardholders and process those transactions. Now it's time to walk through a transaction. Let's say you're buying a pair of shoes. The cashier swipes your card. "They do this to get approval for that transaction," says Harzog. "Their bank, the acquirer, has to find out if this transaction can be approved by sending a request to your issuer." If you're approved, the issuer sends an authorization code back to the acquirer, and then the merchant will get the message that the transaction has been approved. From there, the sale is completed on your end, but the merchant isn't finished. "Every day, the merchant puts together a batch of their transactions that they'll send to their acquirer," says Harzog. The acquirer then sends the batch to the card network, which will then push it along to the issuer. The issuer will then transfer that payment amount to the network, and then to the acquirer. "The retailer gets the transaction amount less the fees that have been involved all along the way from the card network and the banks. That's the cost of doing business for the merchant," says Harzog. Ultimately, you may pay more for an item because the seller passes the fees on to you in some way, says Becky House, education and communication director of the Seattle-based American Financial Solutions, an NFCC member. That's why you'll sometimes have a cash price and a higher credit price if you're purchasing gas, for instance. Then after all this, the issuer sends a monthly statement to you, the cardholder, and you (hopefully) pay the issuer by the due date. How does this all affect you? 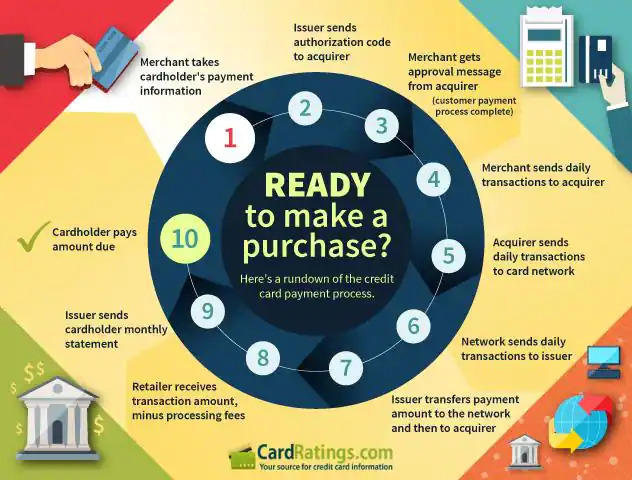 For starters, understanding the difference between issuers and processors will help when shopping around for a new card. "Visa is the most accepted card worldwide, and MasterCard is accepted in most places," says Harzog, who recommends having at least one of those cards. "One reason that has been given as to why Visa and MasterCard has greater acceptance appeal to merchants is due to Visa and MasterCard charging them lower transaction fees for cardholder purchases than Discover or American Express," says Snyder. Of course, American Express and Discover are gaining ground by offering competitive rewards to users, so it could be in your best interest to add one of those to your wallet as well, says Harzog. When it comes down to it, consumers should be researching the issuers when looking to open a new line of credit, says Harzog. "The networks could have benefits and perks that they pass on to cardholders, but the issuer has the power to choose which perks and benefits to include," she says. They also set the credit terms including interest rates, fees, and payment policies. Synder agrees, but points out that the types of benefits networks offer cardholders fall in the category of ease of marketplace acceptance, concierge service, zero liability fraud protection, emergency card replacement, and automobile rental coverage. "Credit card issuer benefits and incentives often take the form of rewards programs that are designed to cause increased credit card use by their cardholders," such as cash-back bonuses, point accumulation and frequent-flier miles, he says. Of course, when it comes to your rights as a consumer, people should understand that they are also protected by government regulation should any disputes or errors be made by the issuer or the processor and then appear on your credit report, says House. "Consumer protections through government regulation include those found under the Fair Credit Billing Act, Truth in Lending Act, Fair Credit Reporting Act, Equal Credit Opportunity Act, the Electronic Fund Transfer Act and the Fair Debt Collections Practices Act," she explains. All in all, it pays to be educated when it comes to your finances. "An important thing for a consumer to do when in the market for a credit card is to determine what aspects rank the highest on their priority list and then shop around for the best match for them," says Snyder.